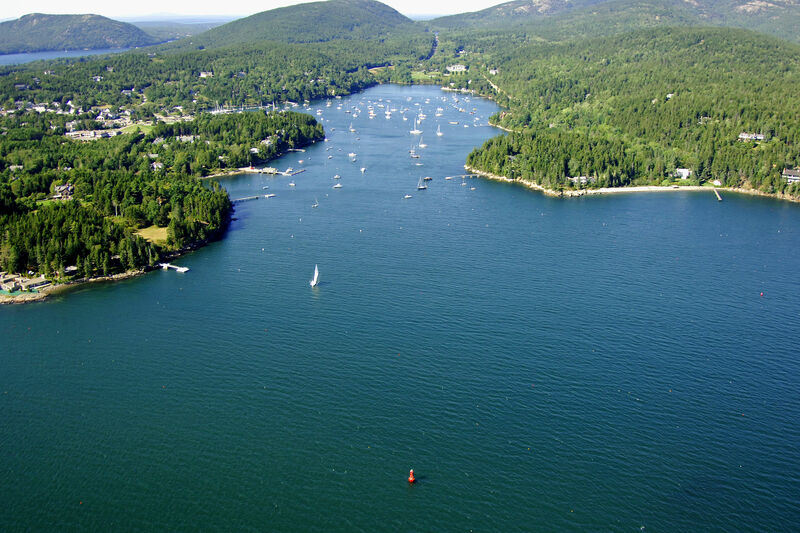 Northeast Harbor is located on Mount Desert Island, just north of Bear and Sutton islands off Eastern Way. Situated on the south side of Mount Desert Island, Northeast Harbor is 27 miles northeast of Vinalhaven and 75 miles southwest of Grand Manan Island. The image above is a view from the southeast looking northwest over the opening of Northeast Harbor where it meets Eastern Way. Off to the left-hand side of the image is Sargent Head (where the white dock and sailboat are), while Pierce Head is visible to the right (east). The entrance channel can be seen working its way through the lobster pots, and if you look closely in the bottom portion of the image, flashing red bell buoy 2 is visible. Lastly, if you look carefully in the upper left-hand portion of the image you can see Somes Sound, which is the only fjord on the U.S. East Coast. 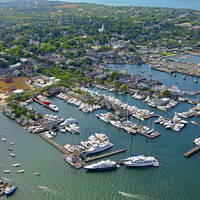 Inside Northeast Harbor you will find four marine and marina facilities. Of these four, only one accepts transient guests. 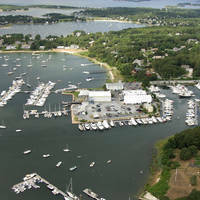 Northeast Harbor Marina has both slips for dockside tie-ups and administers the large field of moorings in the harbor if you prefer an offshore tie up for the evening. If you need to top of your fuel tanks, Clifton Dock is the only game in Northeast Harbor and pumps both gas and diesel fuels. 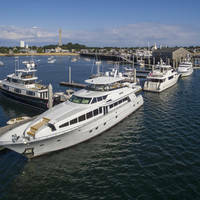 For repairs that require haul-out, you will need to visit Mount Desert Yacht Yard, which has a 20-ton lift for haul-out and related repairs. Asticou Landing offers a dinghy dock, but may charge a fee to tie up your tender. Northeast Harbor is approached from the south via a route around Bear Island from Eastern Way. From the Gulf Of Maine, first set a course to intercept flashing red gong buoy 2, which is located at an approximate waypoint of N44 16.534 W68 13.048. Flashing red gong buoy 2 marks the southern extent of East Bunker Ledge, a large rock outcropping south of Ingraham Point. Once you have safely navigated your way to flashing red gong buoy 2, set a new course of about 295 degrees magnetic for about 2.3 miles to pick up flashing red bell buoy 10 just south of Bear Island. Next, you have a choice of two routes. Just west of Bear Island is a large rock ledge that is almost smack dab in the middle of the entrance to Northeast Harbor. You can go around either side of it, but passing it to its west is pretty much the most direct approach. If you decide to pass it to the east, a line of nun buoys marks the way. From flashing red buoy 10, set a new course to the northwest to intercept flashing red bell buoy 2, marking the aforementioned rock ledge, and leave it decidedly to starboard as you pass. From here, you can set an approximate course of 359 degrees magnetic for .7 mile. 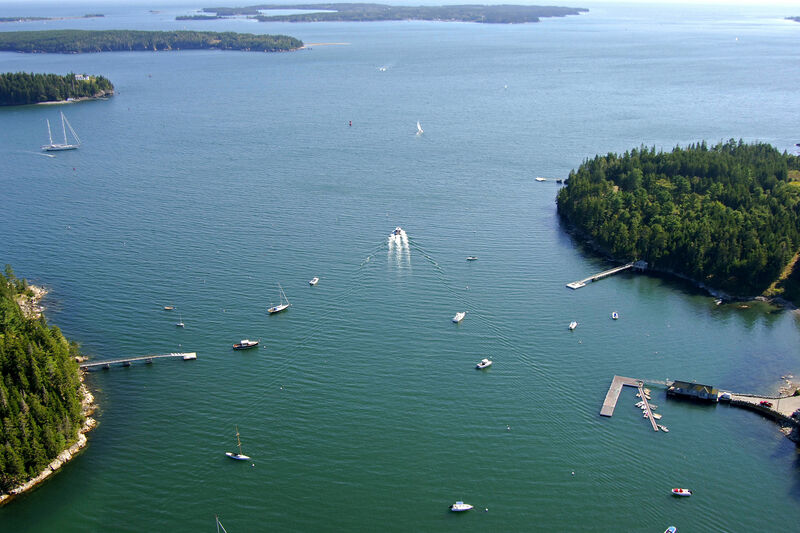 This will drop you right in the middle of Northeast Harbor. No reviews yet! 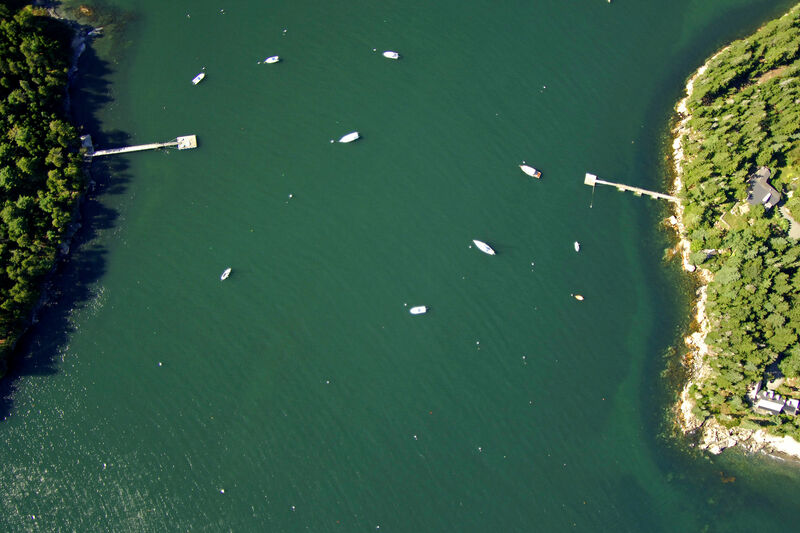 Be the first to write a review of Northeast Harbor Inlet.